Nicholas Sparks is a best-selling author--New York Times Bestselling author. This is only the second Sparks book that I've read, and I was not very impressed. Jeremy Marsh is a successful New York journalist who has uncovered supernatural hoaxes. He's sent to a small town to investigate mysterious lights in a cemetery that many people think are ghosts. There, he meets the town librarian-Lexie- and is intrigued by her. Basically, it's the cliched big city guy meets small town girl and they clash. Can they get past that and still get together. Who will sacrifice if neither wants to live where the other one does? I thought the characters were very cliched. It was a slow-moving story and the explanation for the mysterious lights was a let-down. The writing itself was not very good. There were many cliches, showing, not telling, and a large amount of adverbs. Also, there were perpetual POV changes which really bugged me. 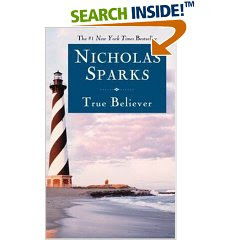 I don't think I'm a big fan of Nicholas Sparks and really can't figure out why he's such a best-selling author. I have another book checked out by him and am debating whether I will read it. Also, I was somewhat expecting a sad ending because Nicholas Sparks tends to do that to you, at least in the movies I've seen. So, I was glad that there was no sad ending, but I did find out there is a sequel which I am in no way going to read. And, there is a sad ending in that one, from what I've read on Amazon. Is he the one who wrote The Notebook? I've read a lot of books by authors who are bestsellers and can't understand how they got to that position, so it doesn't surprise me to hear this. Yes, he wrote The Notebook. I never read it, but saw the movie. He also wrote A Walk to Remember. I saw that movie, loved it, and then read the book years ago. I saw the movie for The Notebook recently and it was okay. It made me want to go read the book to see if it was better. So the other book you've read by him was A Walk to Remember - was it any better than this one? Or were you unimpressed with that one, too? My favorite movie is The Hours, and I went to read the book, thinking it'd be better (usually the book is) and was highly disappointed. This book sounds absolutely yuck. I like the fact that you gave exact examples of why this was a bad read; you essentially made a list of everything I detest in crap fiction. Amanda, I read The Hours as part of a graduate course "Narrative and Film" and I really enjoyed it. It scrambled my brain, but I did like it. I was conflicted over whether or not it was plagiarism, or simply expanding on previous fiction/literary history. Have you read the Doris Lessing story, um, what was it? To room 19, or something. Good story. Anyway, I've got Cunningham's second novel after The Hours checked out from the library right now to give a try on the merit of The Hours, though this one doesn't look as good, I'll give it a try. For some reason I'm on a streak of second novels lately. I thought the plot was good for The Hours, but that the writing was bad. I can't remember all of the exact reasons now, it's been quite a few years, but I just remember getting the impression that it was very mediocre. I was disappointed, because I loved the movie so much that I expected something even greater from the book. It's very rare that I find the book worse than the movie. It's possible that it's just my background in classic lit speaking out. Because that's what I enjoy, I'm real picky about writing, and real critical. It's apparently common sentiment among people who enjoy classic lit that The Hours was badly written, people have mentioned it more than once on all the classic lit groups I belong to. It's a very common concensus among us. I guess we're all snobs. Ah well. I haven't read the Doris Lessing story, I've never even heard of it. A Walk to Remember was okay; I don't remember having a strong opinion of it one way or the other. I did like the movie a lot more than the book. I remember thinking it was okay, but not great. I still need to watch The Hours. I haven't yet. Marcia, that's such a true statement, the more you write the more you notice. I've realized actually that when I edit other peoples' work, I actually learn even more than when I'm writing, and I start picking up things I do in my own prose. Hm, that looks interesting, i might check that out.